Well, it is that time of year again and the MOON-EYES Christmas party is all set for this coming Saturday at the Irwindale Drag strip, I shall be going with Dakota and maybe if I can get Jennifer my girlfriend to come along, that would make such a great Saturday for me. The Mooneyes show is a big event and one you really should try and get too, admittedly parking can be a royal pain in the arse, as there is only really one road in and be prepared to be sat in a traffic jam for a while, as I have done every time, but once in, you can chill and just walk around the show, see the Hot Rods, Custom Cars, Custom trucks, Low Riders and Custom Cycles that are in the show area, the parking lot will have many cool rides too, so always some great eye candy to be had by all. Then there are the Drags that will be running all day, if you want to see and hear Classic iron racing each other over the 8th mile, then this is the place to be for you. There will also be cool sounds coming from the bands that will be banging out their tunes and much to see, as there will be many Vendors to show you what they have and offer. Good food, good sounds and the amazing sounds of the drags makes this a MUST see event of the year. People attend this show from not just California, they get people from all over the globe and I have not been dissapointed yet, I hope to see some of you out there and just relax, and make sure that you take your camera, as there will be a huge bunch of amazing rides there and plenty to show your family and friends back home once you are done. Check all the vendors out as this is the best place to find all your low brow and custom stuff, great for Christmas gift buying and of course, supporting these local vendors helps them too. Everything from Tee shirts, Hot Rod parts, Custom artwork, pinstriping, and the girls can find all their clothing, bags and make up, so it covers everyone, mum,dad, kids an all. Now- the Gates open at 6am but I will be up there probably about 10am and I really hope I get to see some of you out there, it’s an awesome social event that needs to be publicized as much as possible and this is the best show at this time of year. Hundreds of entrants guarantees that there really is something for everyone at this event. Cars, bikes, vendor booths, live music, pinup contest, art auction and more. GENERAL ADMISSION: $5.00 per person over 12 years old.Pin-up Contest is handled by Mitzi & Co. There is a deadline and space is limited. Please contact them for details. Vendor Booth space is very limited. Preregistration does not guarantee a parking space. Although we do have reserved sections for the car show entries, all parking is based on a first come, first served basis. Please arrive early to secure a parking space. Parking is managed by Irwindale Speedway. Once the parking lot is declared full, the gate will be closed and no vehicles will be permitted into the parking area until an official confirms an open space. MOONEYES does not have any control over the parking situation. We apologize for the trouble and any inconvenience this may cause. THE PARKING LOT WAS OVER CAPACITY LAST YEAR BY 7:30AM. Please do not setup tents in open spaces or block empty spaces. Please cooperate with the parking lot attendants at all times. After all, they are just doing their job. Come early, park early, take it easy and enjoy a fine day at the show! Thank you very much. We appreciate your understanding and cooperation regarding the parking situation. We ♥ VANS! We’ll have special section for Vans again this year at the XMAS Party Show & Drag 2013. Vans must use the form and preregistered. No Vans will be permitted without credentials. No registration for vans on Saturday at the gate. Space will be allocated based on the number of vans preregistered. ALL Show & Drag Registration forms, plus the Vendor Booth Application, are now available for download below. PDF reader is required to view the documents. Please print the document, fill out the form completely and send it in. Our address and related information are on the form. For any specific questions, please contact us at sales@mooneyes.com or by calling (562) 944-6311. <CLOSED> Sorry, vendor space is full. <CLOSED> Show Car preregistration is closed. However, you can still register your car at the gate on the day of the show for $40.00. <CLOSED> Sorry, DRAG RACE space is full. Also Bang shift will be having Live streaming, for those who cannot make it,this is what they said. That’s right folks, BangShift.com is going to bring some So Cal weather your way with FREE Live Streaming Video from the 2013 Mooneyes X-Mas Party and Drags at Irwindale this Saturday! While a ton of you will be looking outside at cold weather, we’re still getting our hot rod on here in Southern California, and the 2013 Mooneyes X-Mas Party and Drags is THE place to be this weekend. Last year the entire show area was full by 7:30 am! We want to thank Chico and the gang at Mooneyes for having us, and look forward to all the international audience that will be watching as well. A full schedule is below, but remember it’s this Saturday LIVE from Irwindale so get your beverages and snacks ready and come hang out with us here at BangShift.com starting at 9am Pacific. That’s 11 Central and 12 Eastern for you time challenged folks. 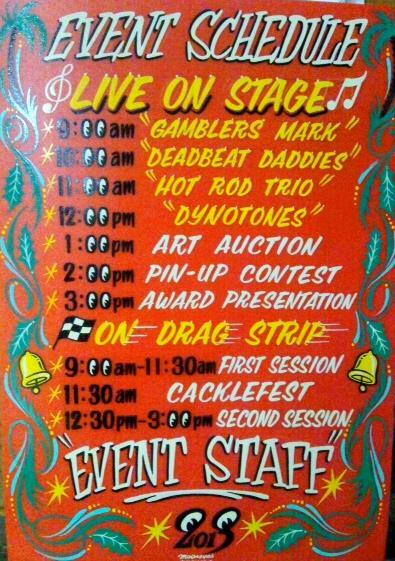 Drag Racing starts at 9am, with a Cacklefest at 11:30am, and then more drag racing into the afternoon. We’ll have interviews with the greats, on track action, cars, bikes, and more. And as always it’s FREE FREE FREE here at BangShift.com. We will have pit reports and interviews going on with Darr Hawthorne and Donnie Couch along with some very special guests. This entry was posted in Blog and tagged brat, BSA, cafe racer, chopper, clothing, custom car, drag, gasser, Honda, hot rod, lowrider, metalflake, music, racing, rockabilly, street rod, triumph, vintage motorcycle.